Just sharing this to spread awareness of what NOT to do while off-roading, overlanding, or enjoying the outdoors. Especially in areas that are already under threat of shutting down. Recently the company TACOMABEAST has been on a cross country expedition exploring all over the western U.S. including here in Utah. I actually was at their big Utah Toyota meet-and-greet recently here in Salt Lake just before they headed south to the San Rafael Swell area and Moab. 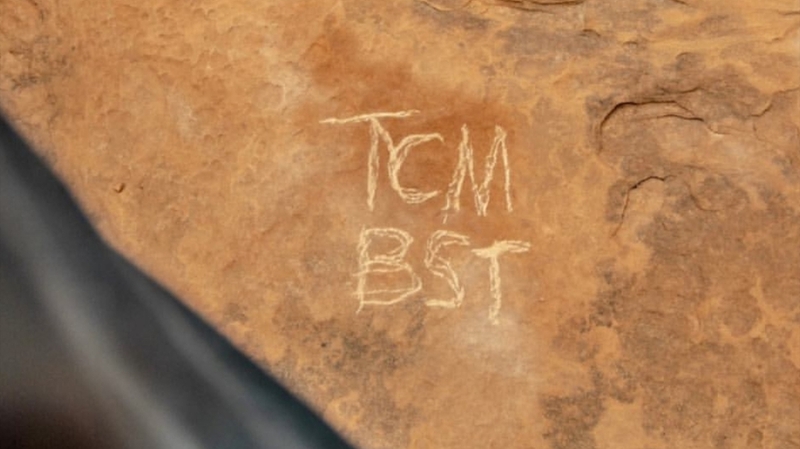 Apparently while in the Moab (Kane Creek) area one of their videographers marked an abbreviated version of the the company name "TCM BST" into a rock for a photo opportunity that has now been circulating on social media and made it to local news even. It is a big mess with all the hate messages flooding into TACOMABEAST and even death threats from some people apparently. The owner of the company has come forward with an apology video and other companies such as CBI Offroad who were associated with the overlanding trip have published formal statements about their involvement in the issue. There is even talk that they are trying to get folks from Utah to repair the vandalized rock. It is a sober reminder of how serious the off-road community takes preservation of the trails and areas we use and explore. Defacement of public or private land is never okay but I also would like to say that death threats are never okay either. Of course we need to preserve our lands for future generations to enjoy but it is taking it too far to threaten the life of another when restitution can be made. The whole situation reminds me of a couple years back when a similar situation arose where someone carved their Instagram name into some rocks near Moab making it easy to identity who did it and they went through the same onslaught of hate and criticism for their actions. The whole situation ended up pushing the person responsible off social media entirely and away from the off-roading community. I hope the best for TACOMABEAST as these are never good situations to be in, but let it be a reminder to all of us how important it really is to be responsible when we are out there on the trails. Sanderhawk, CRFjockey, algonaman and 8 others like this. Last edited by FJX2000; 03-11-2019 at 10:32 AM. CRAW, Sanderhawk, istambull and 8 others like this. If I could be frank, you are playing into 'fake news' and fake outrage. The environmentalists love these type of stories so they can paint offroaders as bad people and get all motorized access banned. Graffiti and actual rock carving dont belong. BUT....and this is a huge BUT. From all the pictures I saw that is NOT CARVED into any rock. It is literally barely scratched onto sandstone from a softer rock. Think using chalk on concrete. I can almost bet it would get washed of with a slight bit of rain. And everyone of those stories including the apology say CARVED into rock....hardly. Secondly...have you seen Moab or any offroad place (rhetorical because I know you have)? Simply dragging sliders or skid plates across comparatively soft sedimentary rock will do way more damage than this. You dont see rockscraping from vehicles being used to feed clicks and internet outrage (not yet anyhow). Also, look at all the rubber and worn tire tracks that are throughout the most traveled trails in Moab and elsewhere in Utah. This is comparatively nothing. This isnt even close to the graffiti vandalism where some idiot paints something on a rock in a National Park. So...my conclusion.....COMPLETELY BLOWN OUT OF PROPORTION...because they have an agenda. And, my honest opinion is by highlighting this bit of 'fake' (e.g. manufactured) outrage only serves their agenda. Just a different perspective. Winterpeg, Sanderhawk, Bar3K and 9 others like this. I agree, things are blown out of proportion. And you're right, after some rain storms you probably wouldnt evnlen be able to tell. But it is still a good reminder of how seriously people take even the small things, and that folks shouldn't even scratch into rocks in the first place ya know? Of course there are more destructive things that can be done, from pushing over rock monuments to spray painting over archeological engravings as has happened in the past. But in the end if this reminder to leave no trace can even influence a single person and keep them from a whole slew of trouble then it is worth it. Sparky of SoCal and amaclach like this. I agree with the philosophy hidden somewhere behind the idea of 'leave no trace'...but its a bit of a misnomer since 'leave no trace' only applies to things beyond the motorized/non-motorized trail. It's impossible to leave no trace on an actual trail (for example, the amount of damage that horses can create to a trail in a wilderness area is well beyond this little stunt by TacomaBeast). The biggest problem is that due to high popularity, a lot of people are expanding trails and going well beyond the original trails especially here in Colorado above treeline. In fact, I'll just point out to all you folks that decide they want to get that pic on Imogene Pass on the rock ledge for your forum avatar (ahem)....that isn't part of the trail and you are contributing in your own small way to wearing out the rock face. Everyone thinks it is now part of the trail, because it has been used for so much picture taking there is a well worn path. I can tell you back in the 80s/90s (e.g. pre internet era before the San Juans gained so much popularity), it wasnt part of Imogene Pass trail. Neither was the now well worn trail at the top that goes down the ridge. I can cite example after example where the top of most 4WD passes in Colorado had just a narrow trail...now they are 3-4 lanes wide with parking areas....due simply to overuse and people stopping and parking off the road and thereby expanding what people think is the trail (Taylor Pass, Webster Pass, Tincup Pass, Engineer Pass...the list goes on). Honestly, I have no idea how to stop it other than limiting access and requiring permits...which is ridiculous for public lands. Anyhow, ill step off my soapbox and reinforce that I strongly agree with the idea of more education about preservation especially given the huge influx of newbies. I prefer to call it "Stay the Trail" as do many of the OHV groups. The 'leave no trace' phrase is something the enviros use to lock up every bit of natural land into Wilderness Areas or Wilderness Study Areas to make them inaccessible to 95% of the people. FJX2000, pyrofreek, amaclach and 4 others like this. Certainly. There are always ways we can all be more mindful of the trails and outdoors, myself included. As long as we all make sure to do our part whether it is “staying the trail” or “leaving no trace” or whatever, we can help make these areas and places last longer which is the ultimate goal I think. I just hope others are made aware of this mistake so they don’t do the same and have to go through the same situation as others have experienced. The “Trail Use, Safety, and Education” section of the forum seems like the best place for this info, as others are hopefully educated from it. SilvFx and amaclach like this. Thank you for posting FJX. I believe the intent of this thread is to raise awareness for the "tread lightly" campaign that we should all be following carefully. If it takes social peer pressure to accomplish this I'm ok with that. Intentional and pointless vandalism should not be confused with dragging skids on the trail where they belong. DubstepPear, FJCRUZA and Firemedic831 like this. What a shame. Tacomabeast and the crew (from what I know and have met) have done more for the community than any of these keyboard warriors. From the many charitable events and educational meets, it's not even something they have to do, but they go out of their way to have free events for the people. Anyway, I'll be honest, I reported anyone without a constructive comment as harassment or bullying. There was no need to throw gasoline and threaten TB in my opinion. HERSOG, Thorn661 and cliffy like this. While I was reading trough all the ugly comet on his instagram, I was compelled to leave my own comment and it went like this. The man has already apologized for what his employee has done, and tow words will get you through many bad times in business or life, “I am sorry” which you already have done. It is little consolation, and no compensation, to the person who is hurt “in this case the sand stone rock” that the offender pleads he did not mean to say or do anything rude, insult or harm anyone, all we are to judge is the fact that any negative comment after his apologies is and will be considered, self pity=loser in life. Up from 450,000 acres, there is now 600,000 acres of San Rafael Swell designated wilderness as signed into law by President Trump today. So there you go, one of the last memories of people off roading in this area is of them defacing it. "In Emery County, the bill increases wilderness in the area to 600,000 acres from 450,000 acres, as well as creates 248,000 more acres of recreation area instead of a more restrictive conservation area designation. It also consolidates about 100,000 acres of Utah trust lands to be more easily developed to raise money for public schools."